You can basically rattle off a Bubba Gump-inspired list of stuff that's great with Huy Fong's Sriracha hot sauce: Sriracha shrimp, Sriracha wings, Sriracha corn, Sriracha burgers, Sriracha fries, Sriracha eggs. Even Tabasco has made Sriracha. What the Pho would you do without it? Inevitably, though, you need to wash down whatever spicy conconction you've inhaled with a bottle of beer. Well, now you can get your Sriracha fix with that beer, too. The beersmiths over at Rogue have made this dream a reality with their Sriracha Hot Stout Beer, available for $13 a bottle. Orders start shipping Dec. 8. 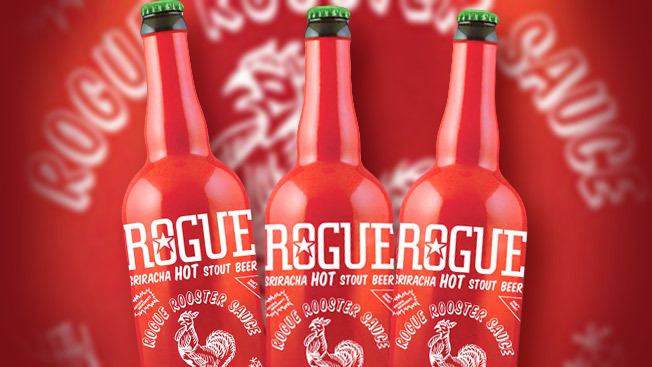 According to the product page: "Rogue Sriracha Hot Stout Beer, made from Huy Fong original hot chili sauce and sun-ripened Rogue Farms ingredients, is ready to drink with soups, sauces, pasta, pizza, hot dogs, hamburgers, chow mein, or anything you'd like to wash down with a spicy kick."